This Dark Brown Leather and Natural Color Hemp Diabetes ID Bracelet, with Diabetes on the front of the medical alert bracelet and is adjustable from 6 1/2 to 9 inches. The medical id plate is 316L surgical stainless steel. 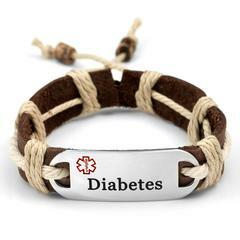 Can be engraved with up to 6 lines of personalized medical information on back. The Plate comes pre-engraved with Diabetes and is exposed on back giving the option of engraving the back with medical information.Engraving is done in black laser! This is not waterproof and should not be worn in water. Great for men, women, teens!